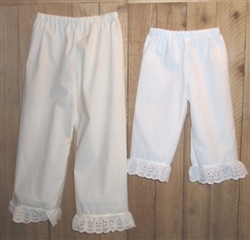 Cotton bloomers in white or cream muslin for ladies in various lengths. Measure length from elastic waist to hem, not inseam. Hemmed with ruffled eyelet lace. Standard length is 26 in or longer lengths. If you want it shorter than 26 in., let us know when you checkout.